President Franklin D. Roosevelt meets with the National Jewish Welfare Board — (left to right) Walter Rothschild, Chaplain Aryeh Lev, Barnett Brickner and Louis Kraft — at the White House on Nov. 8, 1943. 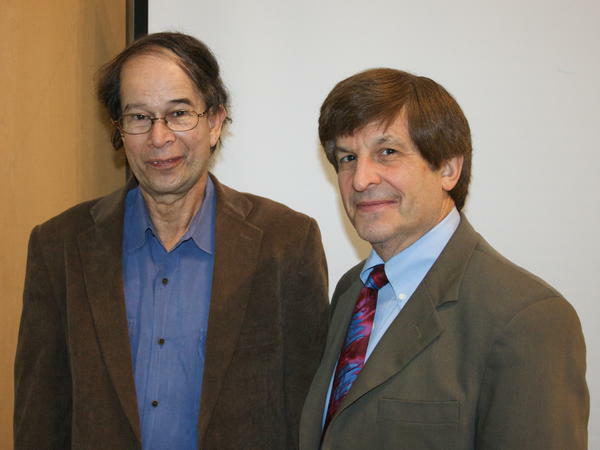 Richard Breitman (left) and Allan Lichtman are distinguished professors of history at American University in Washington, D.C.
On the other hand, FDR said little and did less on behalf of Jews trying to get out of Germany in the 1930s. He has been faulted for not diverting military resources to destroy the Nazi infrastructure of genocide and for not pushing Britain to admit more Jewish refugees to Palestine. Some have even accused him of abandoning the Jews. FDR and the Jews is a richly detailed account of the president's relationship with that community in which historians Richard Breitman and Allan Lichtman deliver an upward revision of Roosevelt's performance. In summing up FDR's record, Breitman and Lichtman write that "his compromises might seem flawed in the light of what later generations have learned about the depth and significance of the Holocaust." But, they add, "Roosevelt reacted more decisively to Nazi crimes against Jews than did any other world leader of his time." "In some ways, that's a statement about Roosevelt's world and the inadequacies of other world leaders at the time," Breitman tells NPR's Robert Siegel. "But that comparison tells us something: that the world of the 1930s and the 1940s was a very different place, and that Roosevelt had both political constraints and international constraints that we don't often think about today." In this way, Breitman says, FDR's track record was markedly different from that of British Prime Minister Winston Churchill. "I think Churchill has the reputation of being philo-Semitic [or appreciative of Jews and Jewish culture] but didn't often back it up with actions. And Roosevelt has the reputation for being unsympathetic but in fact did a number of things behind the scenes which show at least some concern," Breitman observes. FDR's father raised him to not be anti-Semitic at a time when anti-Semitism was common to their class. During his presidency, however, Roosevelt feared that expressions of his concern for the Jews of Europe would inflame anti-Semitism in the U.S. According to Lichtman, that fear affected how FDR and other leaders of the era dealt with the Jewish question. "The 1930s and '40s were a time in America when there was a considerable amount of anti-Jewish, anti-black and even anti-Catholic sentiment and people were worried about upsetting the social order in America," Lichtman says. "But, let me say, this is the poison of anti-Semitism; that the fear of anti-Semitism is often greater than the reality of anti-Semitism. And it was more fear that tended to paralyze key players in the '30s and '40s than necessarily the reality of anti-Semitism." But it wasn't just FDR who was afraid. American Jews were also nervous about rocking the boat and bringing a wave of anti-Semitism upon themselves. According to Breitman, "The American Jewish community was divided both over how much they could accomplish politically and how they should go about it." The Holocaust has relatively few American heroes, but in FDR and the Jews, Breitman and Lichtman credit Treasury Secretary Henry Morgenthau and his team for taking on the State Department and the War Department in the name of supporting Jewish refugees. According to Breitman, Morgenthau's subordinates became convinced that key officials in the State Department were "systematically frustrating" rescue plans and other measures to relieve the distress in Europe. "There was the suspicion that some of [the officials] were anti-Semitic," Breitman says. "There was a certainty that they believed that humanitarian activity in a time of all-out war was at best a distraction and at worst interfering with the war effort." 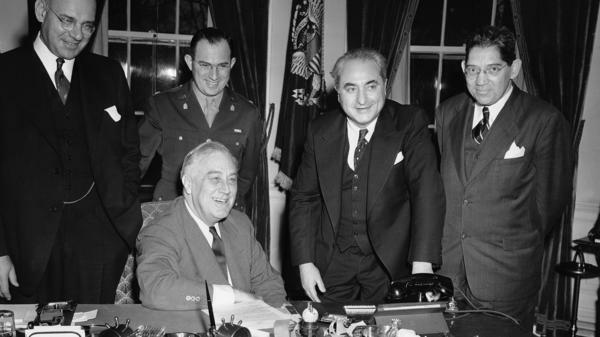 Convinced by his staff, Morgenthau reported the State Department's blocking action to the president, and in January 1944, FDR established the War Refugee Board, which, Breitman says, "saved a substantial number of lives in the last year and a half of the war." In the end, despite struggling for the political will to aid Jews in Europe, FDR's relationship with American Jews remained strong. "The Jews revered FDR," Lichtman says. "They voted for him more strongly than any other ethnic, religious or economic group in the United States. And even after the camps were liberated and the horrors of the Holocaust came to be revealed, the Jews still loved FDR. But they understood his limitations; they understood he was not perfect. But they also understood how much better he was for the Jews than any political alternative in the United States or, for that matter, anywhere in the world." "That's the critical thing," Breitman says, "that we tend, today, to look back and say he didn't do this or he didn't do that. The people who lived in his world saw him against the context of who else was there. And they appreciated the fact that he was better than his predecessors and his rivals." The subject of President Franklin Delano Roosevelt and the Jews is complicated, it's multidimensional and it's contentious. FDR, who had been governor of New York State, won Jewish votes by landslide margins. He led the Allies to victory in World War II and defeated Nazi Germany. Among his closest advisers and strongest supporters were Jews - Felix Frankfurter, whom he named to the Supreme Court; speechwriter Samuel Rosenman; and Treasury Secretary Henry Morgenthau. On the other hand, FDR said little and did less on behalf of Jews trying to get out of Germany in the 1930s. He has been faulted for not diverting military resources to destroy the Nazi infrastructure of genocide and for not pushing Britain to admit more Jewish refugees to Palestine. He's been accused, frankly, of abandoning the Jews. Well, historians Richard Breitman and Allan Lichtman have written a richly detailed account of "FDR and the Jews" - that's the title of the book - and it marks a revision of Roosevelt's performance, revised upward but still with much criticism of what his administration failed to do. SIEGEL: And first, you sum up FDR's record - Richard Breitman, you write that while his compromises might seem flawed, in the light of what later generations have learned about the Holocaust, Roosevelt reacted more decisively to Nazi crimes against Jews than did any other world leader of his time. BREITMAN: In some ways that's a statement about Roosevelt's world and the inadequacies of other world leaders at the time. But that comparison tells us something, that the world of the 1930s and the 1940s was a very different place and that Roosevelt had both political constraints and international constraints that we don't often think about today. SIEGEL: The most obvious comparison would be with Winston Churchill. You would say that FDR was more successful or more highly motivated than the British leader. BREITMAN: I think Churchill has the reputation of being philo-Semitic but didn't often back it up with actions. And Roosevelt has the reputation for being unsympathetic, but in fact, did a number of things behind the scenes which show at least some concern. SIEGEL: Allan Lichtman, FDR - the two of you write - was raised by his father actually not to be an anti-Semite, at a time when anti-Semitism was common to his class. And he was afraid throughout all this that expressions of concern for the Jews in Europe would inflame anti-Semitism in the U.S.
How much of a factor was that in what he decided to do or say about the Jewish problem? LICHTMAN: It was an important factor both for FDR and lots of other players at the time who were concerned about an anti-Semitic backlash. Look, the 1930s and '40s were a time in America when there was a considerable amount of anti-Jewish, anti-black and even anti-Catholic sentiment. And people were worried about upsetting the social order in America. But let me say, this is the poison of anti-Semitism; that the fear of anti-Semitism is often greater than the reality of anti-Semitism. And it was more fear that tended to paralyze key players in the '30s and '40s than necessarily the reality of anti-Semitism. SIEGEL: And it wasn't just FDR who was afraid that doing something for the imperiled Jews of Europe might inflame anti-Semitism. As the two of you write about it, he was getting mixed messages from the American Jewish community, much of which was also saying don't rock the boat too much because it might bring down a wave of anti-Semitism upon us. BREITMAN: The American Jewish community was divided both over how much they could accomplish politically and how they should go about it. SIEGEL: The Shoah, the Holocaust, the genocidal slaughter of Europe's Jews, has relatively few American heroes involved with it. But you guys do give credit to Treasury Secretary Henry Morgenthau and his team. He decided they should take on the State Department and the War Department and do something for refugees. What happened? BREITMAN: Morgenthau's subordinates became convinced that the State Department, or key officials in the State Department, were systematically frustrating action to relieve the distress in Europe and rescue plans as well. SIEGEL: Why? Why did they figure they were doing that? BREITMAN: There was the suspicion that some of them were anti-Semitic. There was the certainty that they believed that humanitarian activity in a time of all-out war was at best a distraction and at worst interfering with the war effort. SIEGEL: And what did they do at the Department of the Treasury? BREITMAN: They took the evidence to Morgenthau. They convinced him. Morgenthau then took a detailed report on the State Department's blocking action to the president. And President Roosevelt, in January of 1944, established a new body - the War Refugee Board - which saved a substantial number of lives in the last year and a half of the war. SIEGEL: Allan Lichtman, explain something. The great oddity to me of all this is that as there's a struggle to get the U.S. to do more about the Jews in Europe, Roosevelt is racking up Jewish votes like nobody's business. I, you know, was raised by (unintelligible), my mother who told me about breaking down in tears the day she heard that FDR died. He was a sainted figure to the Jews. LICHTMAN: Jews revered FDR, voted for him more strongly than any other ethnic, religious or economic group in the United States. And even after the camps were liberated and the horrors of the Holocaust came to be revealed, the Jews still loved FDR. But they understood his limitations. They understood he was not perfect. But they also understood how much better he was for the Jews than any political alternative in the United States or, for that matter, anywhere in the world. BREITMAN: That's the critical thing, that we tend today to look back and say he didn't do this or he didn't do that. The people who lived in his world saw him against the context of who else was there. And they appreciated the fact that he was better than his predecessors and his rivals. SIEGEL: Professors Richard Breitman and Allan Lichtman, thank you both very much for talking with us. SIEGEL: Allan Lichtman and Richard Breitman are the authors of new book "FDR and the Jews." Transcript provided by NPR, Copyright NPR.